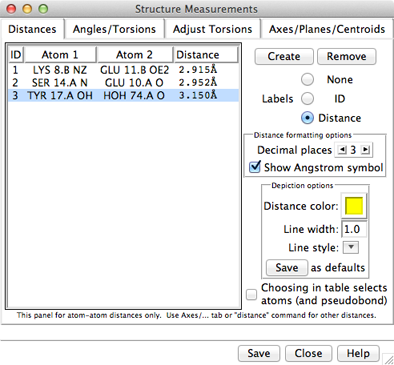 Atomspec display style in the Labels preferences controls how atoms are listed in the Structure Measurements dialog. The Distances figure shows the simple style (residue name, residue specifier, and atom name). For an example of command-line specifiers, see the Adjust Torsions figure. Save saves measurements to a file. Close closes the measurements panel, and Help opens this manual page in a browser window. Selecting exactly two atoms, then clicking the Create button on the dialog. With default mouse settings, two atoms can be picked (selected from the graphics window) by Ctrl-clicking the first and Shift-Ctrl-clicking the second. Doubleclick-picking an atom when one other atom is already selected, then choosing Show Distance from the resulting context menu. Doubleclick-picking an atom when 0 or >3 other atoms are already selected, then choosing Show Distances to Nearby Residues from the resulting context menu. The distance list can be sorted by the values in any column by clicking the header. Clicking the header once sorts the entries in order of increasing value and places an up arrowhead (triangle) in the header. Clicking again sorts the entries in decreasing order and places a down arrowhead (inverted triangle) in the header. A distance monitor can be chosen by clicking on its line, and more than one can be chosen at a time. Chosen lines are highlighted in the dialog. Ctrl-click toggles the status of a line, while clicking on the first (or last) line of a contiguous block and then Shift-clicking on the last (or first) chooses all of the lines in the block. Choosing a distance listing selects the corresponding distance pseudobond. The Choosing in table... option allows additionally selecting the corresponding atoms. Remove deletes the chosen distance monitors. If there is only one, it is not necessary to choose it before using Remove. The formatting options Decimal places and Show Angstrom symbol control how distance values are shown in the table and (when Labels is set to Distance) in labels. The Decimal places can be changed by clicking or holding down one of the arrows on either side of the value. Of course, decimal places beyond those present in the input coordinates are not very meaningful. Changes in distance formatting options are automatically saved in a user's preferences file and also apply to distances shown with FindHBond. Line style - whether solid, dashed, dotted, etc. Settings of individual pseudobonds (as well as pseudobond groups) can be changed using the the Selection Inspector or the command setattr. The Angles/Torsions section of Structure Measurements is a table of angle monitors (measurements that update if there are changes). A “bond angle” is measured for three atoms and a “torsion angle” for four atoms; however, it is not necessary for the atoms to be contiguous or even bonded to one another. Angle monitors are saved in sessions. Angles/Torsions reports changes but cannot be used to change the angles. Angles can be changed using Adjust Bond Angles and Adjust Torsions. Selecting exactly three atoms for a bond angle or four atoms for a torsion angle, then clicking the Create button on the dialog. With default mouse settings, atoms can be picked (selected from the graphics window) by Ctrl-clicking the first and Shift-Ctrl-clicking additional atoms. Doubleclick-picking an atom when two other atoms are already selected, then choosing Measure Angle from the resulting context menu. Doubleclick-picking an atom when three other atoms are already selected, then choosing Measure Torsion from the resulting context menu. The angles/torsions list can be sorted by the values in any column by clicking the header. Clicking the header once sorts the entries in order of increasing value and places an up arrowhead (triangle) in the header. Clicking again sorts the entries in decreasing order and places a down arrowhead (inverted triangle) in the header. A measurement in the list can be chosen by clicking on its line, and more than one can be chosen at a time. Chosen lines are highlighted in the dialog. Ctrl-click toggles the status of a line, while clicking on the first (or last) line of a contiguous block and then Shift-clicking on the last (or first) chooses all of the lines in the block. Choosing an angle monitor also selects the corresponding atoms and bonds when the Choosing in table... option is on. Remove deletes the chosen measurement(s). If there is only one measurement, it is not necessary to choose it before clicking Remove. The Decimal places setting controls how angles are reported in the table; the number of digits shown after the decimal can be changed by clicking or holding down one of the arrows on either side of the value. The command angle can also be used to measure bond angles and torsions; however, it yields a static measurement rather than a continuously updating monitor. 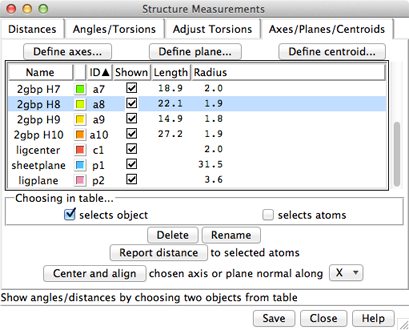 There are several ways to start Axes/Planes/Centroids, a tool in the Structure Analysis category. Clicking Define axes... opens a dialog for specifying atom/centroid sets and other axis parameters. Eigenvectors/values are calculated from the coordinates of each set of atoms/centroids after subtracting the position of their collective centroid. Each axis is anchored at the corresponding collective centroid and aligned with the principal (largest) eigenvector of the corresponding coordinates (prior to any helical correction). Each helix in [models] - define an axis for each peptide/protein helix in the molecule model(s) chosen in the list. 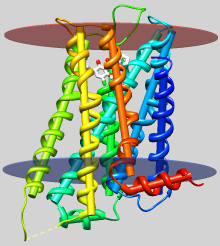 Peptide/protein helix assignments are taken from the input structure file or generated with ksdssp. Only the backbone atoms N, CA, C are used to define the axes. Sometimes two helices are adjacent in sequence (not separated by any other residues), and the integer-valued residue attribute ssId is used to distinguish them. Although such cases are detected automatically, ssId can also be set manually with setattr. Mass weighting (only available for the Selected atoms/centroids option) - calculate major inertial axis by mass-weighting the atoms/centroids; cannot be combined with helical correction. The radius of a centroid (Å) is used as its “mass” (daltons). Use helical correction - adjust axis orientation to reduce the spread of atom-axis distances; cannot be combined with mass weighting. While usually small, helical correction improves results for short helices. Only one color well setting and one constant radius value can be specified at a time, but axes with different colors and radii can be created in successive stages when Replace existing axes is turned off. Clicking Apply (or OK, which also closes the dialog) calculates the axes, adds them to the table, and generates the corresponding objects. Axis radii are reported in the Reply Log. Clicking Define plane... opens a dialog for defining a plane based on the selected atoms. Eigenvectors/values are calculated from the atomic coordinates after subtracting the position of their non-mass-weighted centroid. The plane is anchored at the centroid and aligned with the two largest eigenvectors (the third-largest eigenvector is normal to the plane). Set disk size to enclose atom projections (true/false) - whether the disk radius should be set to span the projections of the defining atoms back onto the plane. If true, an Extra radius (padding) can be specified (default 0.0 Å). If false, a Fixed radius can be specified (default 10.0 Å). The disk center is the non-mass-weighted centroid of the atoms. Clicking Apply (or OK, which also closes the dialog) calculates a plane based on the selected atoms, adds it to the table, and generates the corresponding object. Plane radius is reported in the Reply Log. Clicking Apply (or OK, which also closes the dialog) calculates a centroid based on the selected atoms, adds it to the table, and generates the corresponding object. Centroid coordinates are reported in the Reply Log. The table can be sorted by a column by clicking the column header. An object can be chosen by clicking on its line, and more than one can be chosen at a time. Chosen lines are highlighted in the dialog. Ctrl-click toggles the status of a line, while clicking on the first (or last) line of a contiguous block and then Shift-clicking on the last (or first) chooses all of the lines in the block. Conversely, picking an object from the screen will choose it in the table. Clicking Delete removes the chosen objects. In addition, closing a molecule model or deleting atoms removes any objects defined using those atoms. Rename allows changing the names of the chosen objects; this will change their order in the table if sorting is currently by name. Report distance measures distances between the chosen objects and selected atoms; results are sent to the Reply Log. If a single atom is selected, the distance to each chosen object is reported; if multiple atoms are selected, the minimum, maximum, and mean distances are reported. Plane information also includes radius and orientation expressed as a normal unit vector.